Comfort, style and quality are the watchwords of all meco's folding chairs and tables. from trend-setting all-steel or steel and upholstered folding furniture to the comfortable and high-style designs of our dining-height folding chairs, your dining pieces deliver temporary seating beyond your expectations. 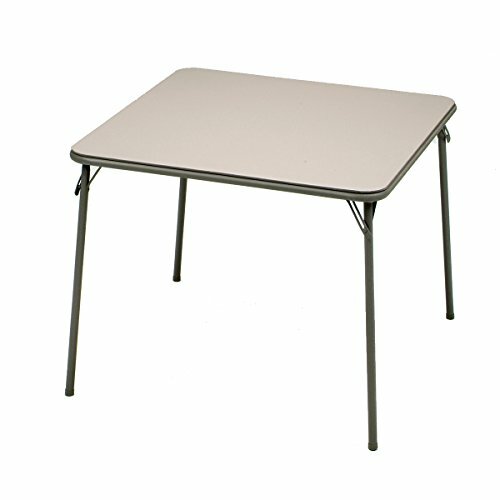 our 34-inch square folding table is no exception, offering versatile dining space for 4 along with durable vinyl upholstery and tubular steel frame construction. so go ahead, make your guest list a bit longer. whether it's drop-in friends or a planned party, you'll have easy setup, plenty of room and quick takedown. its easy wipe-clean surfaces are great for entertaining and crafters will find it the perfect size for keeping supplies nearby while still having room to work. the chicory lace powder paint finish resists scratches and abrasions. the durable table top is upholstered in matching chicory lace vinyl fabric. e-z action sliding leg locks provide stability and non-marring leg.